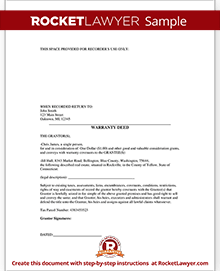 A Warranty Deed is commonly used to transfer interest in a property or land to a new owner in exchange for an agreed upon sale price. A Warranty Deed is a preferred method of transfer as it provides the Grantee (Buyer) with guarantees that the property purchased is free of debt or other liens and that the Grantor (Seller) has the authority to sell the property. You are selling or buying the property and want to have warranties against problems with the title included in the deed. You are transferring ownership in a property to a trust. You own a business and you want to buy or sell real property. Property address, parcel number and legal description of property that is being granted: The legal description may be found on the Seller"s Deed. The parcel number is listed on the property"s tax statement. Alternatively, both the legal description and parcel number may be obtained from the office where property taxes are paid in the city, county or parish where the property is located. 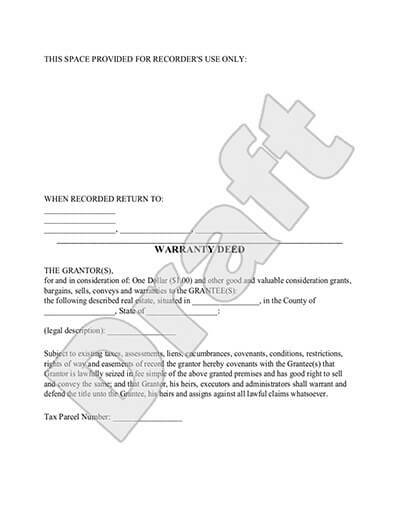 Names and addresses of parties to the Warranty Deed: This includes the Seller and Buyer of the property. The Seller"s name must be as it appears on the current deed or property tax statement. The Buyer"s name should be how Buyer wants it to appear on the Warranty Deed. Addresses for the parties should be their physical address, include the county where they live and cannot be a post office box. County and State where Seller will sign the Warranty Deed. Specify the party that will receive the original recorded deed: This may be the Seller, Buyer, Trustee or Attorney who will receive the original recorded deed. You may also receive copies from the Recorder"s office. Specify whether or not money is being exchanged for transfer of property: Typically no money is transferred if there is a simple change to the property title (i.e., misspelled name) or if the transfer is between family members. If money is being exchanged, specify the amount. Specify whether Seller will reserve any interest in the property"s oil, gas or other mineral rights: If yes, specify percentage of rights retained. Specify whether Seller will reserve a life estate interest in the property being transferred: This means that the Seller will retain an ownership interest in the property until death. In order to make the Warranty Deed legally binding, the Seller needs to sign it front of a notary public. Then signed and notarized deed must be filed at the city or county office for recording property documents. Before filing with this office all previously billed property taxes must be paid in full. If you have any questions about what's right for you and your business, consult one of our contracted lawyers for legal advice. Our step-by-step interview process makes creating a printable Warranty Deed easy.